Renee not only does intradermal cosmetic procedures and body art tattoos, but she also teaches them. The classes are limited to a maximum of 4 students for a more personalized education. Call us to reserve your spot soon as spaces are filled quickly. Through the use of hands-on training and live demonstrations; you will learn, step-by-step, the basic techniques of applying permanent eyebrows via the Microblading technique. This is a very intensive and comprehensive hands-on program. The student will learn on how to perform complete procedures from beginning to end. This will be done with complete supervision while discussing best tips and techniques and a full hands-on approach. The aim of this course is to give the student hands-on practice and furnish the student with complete confidence to perform this procedure themselves in their own business. 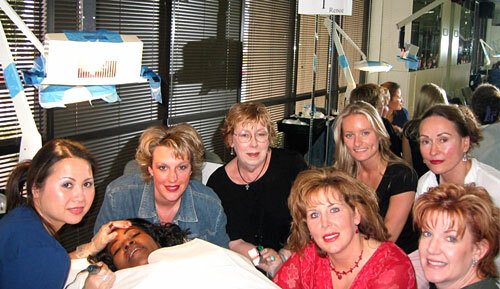 Through the use of hands-on procedures and live demonstrations; you will learn, step-by-step, the basic techniques of applying permanent eyebrows, lip liner, full lips, and eyeliner procedures. This is a very intensive and comprehensive hands-on program and the student will be performing up to 5 procedures a day on live models. The student will learn on how to perform complete procedures from beginning to end. This will be done with complete supervision while discussing best tips and techniques and a full hands-on approach. The aim of this course is to give the student hands-on practice for all of these procedures and furnish the student with complete confidence to perform these procedures themselves in their own business. This advanced course covers removal and corrective work, areola and camouflage procedures, mucosal eyeliner, and hairline stroke eyebrows. The class also covers advanced techniques and paramedical applications, as well as color correction and tips for eliminating time and touch-ups. In this introductory course, you will learn the fundamentals of Baby Body Art Tattoos. Students will learn all aspects of the coil machine: how it works, proper tuning, troubleshooting and needle configurations for lining and shading. Stencils will also be covered: how to make and apply them, custom and free hand techniques, and proper placement. I will lecture and demonstrate outlining, shading and color blending techniques. This class also covers healing, scar prevention, personal and customer considerations, and sterilization. And for those who are gun shy, a demonstration will be given showing effective baby body art with a pen machine. In this class, the fundamentals of the tattoo machine (coil machine) will be covered. Step by step instruction is provided as the student participates hands-on to assemble, adjust and disassemble the tattoo machine. The student will also learn how to tune and repair coil machines. This course also addresses needle configuration recommendations, machine selection and troubleshooting, and other various digital and conventional machines and power supplies. In this class, the student is taught the techniques to properly attach lash extensions to give a more natural and fuller look. NOTE: The price quoted for this class is subject to change and that Renee reserves the right to increase the cost of tuition if a deposit is not secured before the price change. This price does not include materials or supplies necessary for practicing permanent cosmetic procedures. Live models are based on availability. Intradermal Cosmetics falls under the regulation of tattooing in the state of Texas. It is the student's responsibility to contact the regulatory agencies in their area and abide by all regulations that may apply. Learning cosmetic tattooing is a process and proficiency is achieved only through practical application.